You’ve come to the right place if you’re looking to make extra revenue from your site without adding any more content or ads. 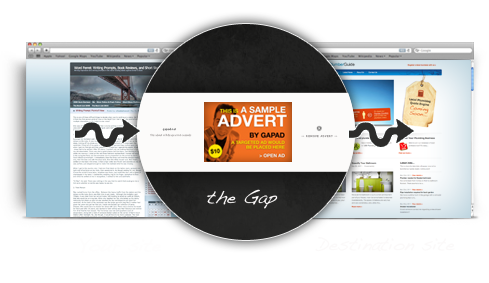 It’s simple, when people leave your site to visit another site, GapAd displays an advert in the gap between the two sites for a few seconds – you get the revenue made by these ads. Our technology automatically places ad triggers on all of your exit links and displays targeted adverts when people leave your site. You can easily bypass any exit links where you do not wish ads to display. So it’s really money for nothing? Yep, no need to add any extra content on your site, no need to ad any more ads on your site, no need to replace any of your existing adverts on your site. In fact your site doesn’t change at all!